Liberty’s Craig Lutwen slides safely into home to break a 1-1 tie and send the Patriots to an 8-1 win over New Albany in Friday’s Division I regional championship at Dublin Coffman. 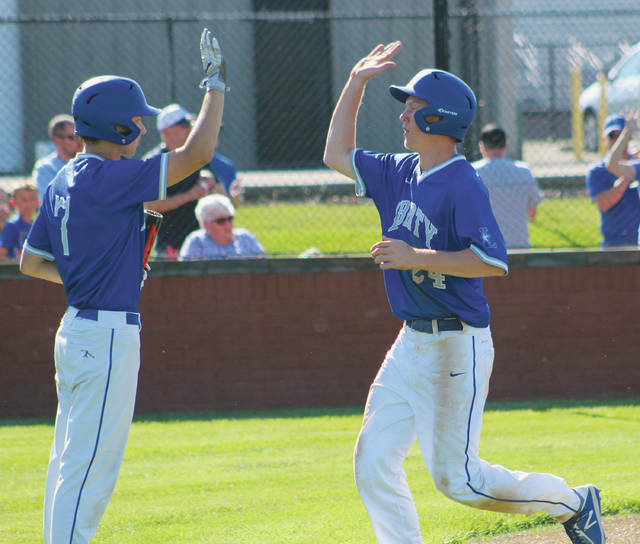 Liberty’s Mitchell Okuley and Corbin Parrish (7) celebrate a run during Friday’s Division I regional championship against New Albany. Olentangy Liberty baseball coach Ty Brenning thought about all the players that have come through the program over its 15 years of existence. Many of them were lined up along the brick wall down the third base side. Some of them were in his own dugout as assistants. And they witnessed something that had never been accomplished before: a regional title. Jack Metzger went the distance on just 87 pitches to lead Liberty to an 8-1 win over New Albany in the Division I regional final Friday at Dublin Coffman. The Patriots did the same thing they’ve done throughout the tournament. They used a solid pitching performance and timely hitting to get the job done. Metzger allowed one unearned run on four hits, a walk and two hit-batters. It was the second straight game Patriot pitching has held an opponent to just one run. Mitch Milheim went the distance in Thursday’s win over Lancaster. 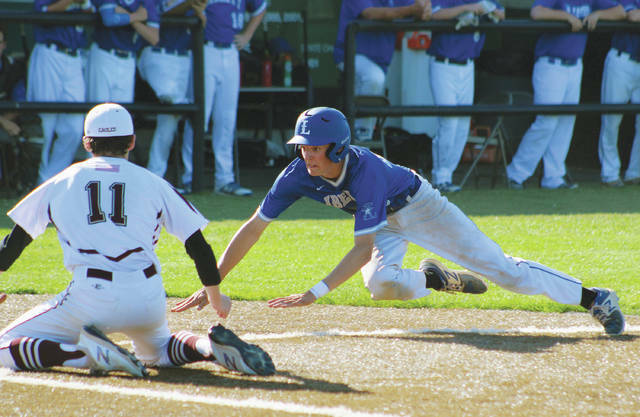 Metzger went the front four innings and Milheim followed with the final three in Liberty’s 2-1 district semifinal win over Orange in a game that needed two days to finish because of the weather. That left the door open for Brennan Rowe to do the job in the district final. Add to that the outstanding job done by Michael Osmond and Beau Foster among others in the regular season. So, that had to make Brenning’s decision hard, right? He had a plan. Metzger would be first up if needed Thursday. He wasn’t. Rowe, Osmond and Foster were on deck for Friday if needed. They weren’t. But, that’s one of those good problems. Metzger’s only rocky inning was the third when Spencer Tammaro worked a bases-loaded walk to tie the game 1-1 after a pair of errors sandwiched around an Alex Arenschield single had loaded the bases. All of it came with two outs. Metzger recovered to set down the next seven batters. By the time New Albany got its offense going again in the seventh, the game was already well in hand for Liberty. Craig Lutwen led off the fourth with a walk and scored the go-ahead run on a wild pitch. Metzger pushed the lead to 3-1 on a RBI single. Corbin Parrish (double) and Lutwen (single) each added RBI hits as Liberty blew it open with a four-run fifth. Carson Comer had two hits and scored twice and Rowe and Parrish had two hits and a RBI apiece to lead the Patriots (28-4). Arenschield took the loss for the Eagles ( 20-9). He allowed five runs (four earned) on nine hits and two walks with three strikeouts over 4.1 innings of work. Liberty faces Medina Highland in the state semifinal at Huntington Park Friday at 10 a.m.